The European Union went through significant changes with regard to their external image since 2010. Quickly after their establishment the EEAS and EU delegations found themselves the task to revive the EU’s democracy promotion strategy for the MENA region. While popular protests in the neighbourhood during the past three years questioned the aims of the EU in this region, Palestinians have showed their dissatisfaction with the regimes controlling their lives for decades. The wish of millions of Palestinians for equal representation and safety has not been fulfilled, leading to widespread dissatisfaction with current government structures and growing frustrations with the expanding controls of the Israeli occupation. But the list of objectives shared by the EU for Palestine makes it clear that democracy as a policy goal will have to compete with aims of security, stability and the status quo. To understand how this competition plays out the work from Grimm and Leininger (2012) is used to trace the dilemmas the EU faces in Palestine. Following a thorough investigation of local challenges and EU activities, behaviour of ignoring, sequencing and prioritizing these dilemmas can be noticed within the EU. The theory of conceptual politics as used by Kurki and Hobson shows how definitions of contested concepts matter and how the conceptualization impacts material relations. Together with an analysis of the institutional environment, these two facets are explored to understand the different types of behaviour among the main EU actors. This application offers insights in the possibilities of the EU delegation, the European Parliament and the EEAS and HR to practice their own interpretation of the general EU objective of a “democratic Palestinian state”. 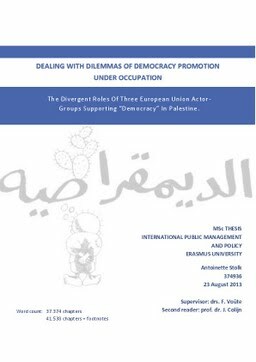 This study enables to capture the innovation in institutions and policies that is taking place within the EU, while at the same time structural problems are noted that continue to restrain the EU from making democracy a true objective in their policies towards Palestine.